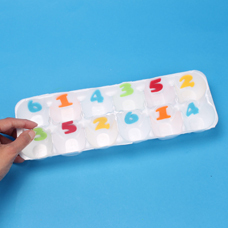 Use melty beads and an egg carton to create a simple sorting and counting activity for preschoolers. 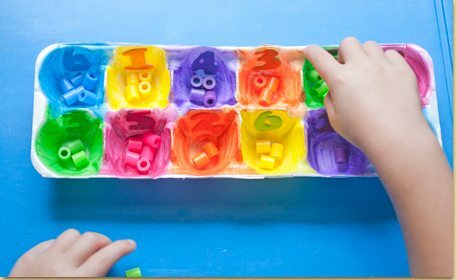 This activity is great for the classroom or home learning environment. Chose (2) sets of number stickers 1-6. Stick (1) number sticker, randomly, on each egg carton cup. All the cups should have a number when finished. 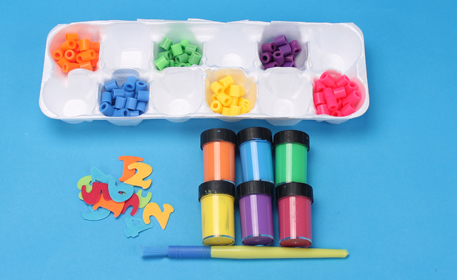 Choose (6) different colors of melty beads. Then choose matching paint colors. We used orange, blue, yellow, green, purple and dark pink melty beads and paint. 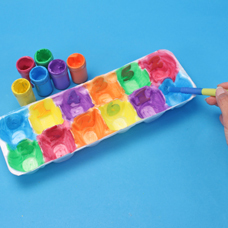 Paint (2) egg carton cups with each color. Mix up the colors, so the same color is not in a row. Paint over the number stickers, so the entire cup and number are the same color. Let dry. 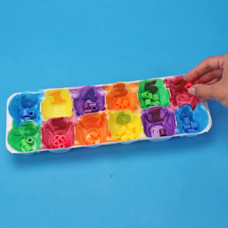 Preschoolers can practice sorting and counting using the melty beads. Match the melty beads to the color and count out the number of beads. For example, (6) green melty beads would be put in the egg carton cup that is green and has a number 6. Practice fine motor skills by using small tongs or tweezers to pick up the beads while sorting and moving the beads to the cups.